This article examines the emergence and development of a women’s self-defense movement during the Progressive Era as women across the nation began studying boxing and jiu- jitsu. The women’s self- defense movement arose simultaneously with the rise of the physical culture movement, concerns about the strength and future of the nation, fears associated with immigration and rapid urbanization, and the expansion of women’s political and social rights. 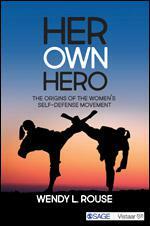 However, the meaning and transformation wrought through self- defense training varied from individual to individual. Women were inspired to take up self- defense training for very personal reasons that ranged from protecting themselves from stranger attacks on the street to rejecting gendered notions about feminine weakness and empowering themselves. Women’s training in boxing and jiu- jitsu was both a reflection of and a response to the larger women’s rights movement and the campaign for the vote. Self- defense training also opened up conversations about the less visible violence that many women faced in their own private lives. racial boundaries. Women’s training in self-defense was both a reflection of and a response to the broader cultural issues of the time, including the women’s rights movement and the campaign for the right to vote. The discussion surrounding it opened up conversations about the less visible violence that many women faced in their own homes. Through self-defense training, women debunked patriarchal myths about inherent feminine weakness, creating a new image of women as powerful and self-reliant. Our new book 'Her Own Hero' presents a fascinating and comprehensive introduction to one of the most important women’s issues of all time. The book takes us back to the time of the twentieth century, some women were inspired to take up boxing and jiu-jitsu for reasons that ranged from protecting themselves to rejecting notions about feminine weakness. Grab your copy of the book today.